It is very odd that the most Sacred Syllable of Buddhism and Hinduism came to replace the most Sacred Syllable of Heavenly Father. It is odd, and problematic, because when OM replaced AH, enlightenment, liberation, became impossible. If you question that, look at the facts. Even by Buddhists own reckoning, the last time a person became an awakened Buddha, a Messiah, was at least two thousand five hundred years ago. Since then, not one person has reached the gates of heaven because the knowledge to do so disappeared. 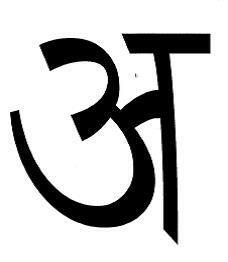 It disappeared when OM replaced the Sacred Syllable of AH, the first letter and syllable of the Sanskrit alphabet. The first letter of the alphabet is similar to many others around the world in beginning with “A” or “a”. The letters, syllables, and words of the Sanskrit language all have meanings, and “a” can mean “ah”, or is added before words to give it a negative sense or as a comparison, and is the first of the three sounds of the Sacred Syllable OM. The three sounds of the Sacred Syllable OM are “a, au, um,” and can be printed as ĀŪM. The second sound is the syllable of “au” and it has the sound of “ow” in “cow.” According to Sir Monier-Williams’ Sanskrit-English Dictionary, au is a sound, a calling, or is the Sacred Syllable of the Ṡūdṛas. The Ṡūdṛas were of the lowest of the four classes in the Hindu Caste System, whose only mission was to serve the other three. The four classes are Brahmins, Kshatriyas, Vaishyas, and Ṡūdṛas. Remember, the Teaching of the Holiest is service to others upon the earth. The syllable of “um” is an interjection of compassion, a particle implying assent, consent, acquiescence, or agreement. With that in mind, here is a definition of the three sounds of the Sacred Syllable of ĀŪM, “The first sound of the Sacred Syllable OM is the Sacred Syllable of the Ṡūdṛas, a particle implying acquiescence.” Therefore, the Sacred Syllable for purposes of chanting or meditation is not OM, but AH. Yes, AH! Here are the words of God for the day of acquiescence. To penetrate with the breath and to submit one’s self to is how to obtain a fasten to AH, to assist the offer of AH is beloved AH and to shake down from a tree the cause to fall off is AH.